Do you want to know how to increase your janitorial customer retention dramatically? Silly question, right? Of course you do! But what exactly is “customer retention” and how do you achieve it? In practice, customer retention is less about you keeping your existing cleaning accounts and more about having your customers not get rid of you. To acquire new customers, you spend a lot of time, effort and money to market and sell your services. Once you get a new customer, that’s just the beginning; Now you have to keep them! You actually need to move from “Customer Retention” to “Customer Loyalty” to thrive in this business. There’s a lot to be said on this subject (and I promise to to do so in future articles), but for now, let me start with my core “Customer Retention/Loyalty Tips” that have served me so well for over 25 years in this great janitorial industry. COMMUNICATE: Right up front, when you do a walk through before preparing a proposal, make sure that you communicate with your contact about exactly what they expect. Do they have a checklist or do they want you to create one? Then, when you get awarded the account, make sure that you have a signed Service Agreement, spelling out the details and terms of your service. Customers understand the necessity of this document. Be on the same page on day one! SIMPLY DO WHAT YOU SAY YOU’RE GOING TO DO: Keep your promises! 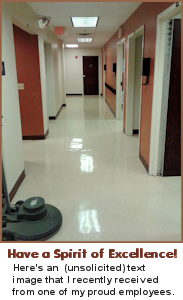 If your proposal stated that all waxed floors will be polished once per week, then do it. If it noted that return vents and blinds are dusted monthly, then do it. I know one national franchise that promises (on their proposals) to take all the trash cans outside and wash them every month. Of course, it rarely gets done. That task wasn’t required, but since it was promised, it became expected and was subsequently viewed as a failure to perform. If I had a quarter for every new customer that told me, “the last cleaning company didn’t do what they promised”, well.. I’d have a lot of quarters. KEEP THEIR BUILDING CLEAN: The #1 way to keep your customer happy and loyal is to keep their building clean! The #1 way to keep their building clean is to do regularly scheduled checklist inspections for quality control! It’s good and actually necessary for your customer to like you, but that alone will not keep you there. You need to consistently keep their facility clean and even exceed their original expectations. Go the extra mile, it will be well worth it. Strive to be a top service provider! THEY NEED TO LIKE YOU: Hear me out on this one. I’m not talking about a joke telling, fishing buddy (although, being “professionally” personable and friendly goes a long way towards customer loyalty). Instead, when they like the way you and your company take care of their facility, they will also like you! Yes, cliché, but take care of your customers and they will take care of you. BE PROFITABLE: You want to “retain” profitable customers. If you’re losing money on an account or just breaking even, then you will stop caring about the things that will make your customer keep you. They’ll probably drop you and you won’t care. Do all you can to keep your costs down and quality up. But if, for example, you start cleaning a private school with 200 students and 6 months later they’ve increased to 300 (which will increase your labor hours up to 2 hours a day), then it’s time to sit down and talk about a fair price increase. Even the Good Book says, “the worker is deserving of their pay”. That’s good enough for me. TRAIN YOUR EMPLOYEES: To provide consistent quality cleaning on an ongoing basis, your crew needs to know what to do. You need to have some type of training on cleaning techniques, chemical use, customer relations, safety, protocol, procedures, production rates, etc. A trained and competent employee creates a loyal customer! USE CHECKLISTS TO MANAGE “THE SYSTEM”: A checklist of exactly what is done each day is not just a good idea, but an absolute must to succeed. e.g. 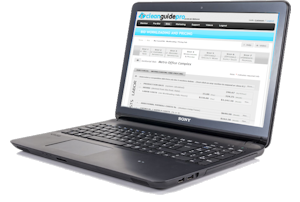 Individual employee checklists, area checklists, specialty work checklists, end of night supervisor checklists, monthly inspection checklists, etc. That’s managing a system that works! EMPLOYEE UNIFORMS/BADGES/NAME TAGS: At each customer location, project an image of trust, structure and professionalism. After hour customer accounts should still have company t-shirts with your name and logo. And higher profile accounts need to project a more professional image. Specifically, polo shirts with logos and khakis, with employee lanyard or company identifying name badges need to be worn. The more your customer sees your employees, the sharper they need to look! WHATEVER IT TAKES! : Commit to being that person that finds solutions. Every problem and situation has a perfect solution. Some tougher than others. Are you willing to fulfill a customer’s last minute, 4pm request to wax or polish floors tonight because their corporate boss is visiting tomorrow? Will you miss a little sleep or work late to provide a solution? Expect the unexpected! When another cleaning company comes “a courting”, they will say “No thanks, we’re very happy with our current cleaning service”. That’s customer loyalty! HAVE A SPIRIT OF EXCELLENCE! : If you have a mindset of “it’s good enough, they’ll never notice, everyone cuts corners”, I know 4 coats of wax would look awesome, but 3 is enough for tonight”, then you don’t get it. When I used to ask my Floor Techs how a job came out and they would say “good”, I would ask them “do you know who the enemy of excellence is”? It’s “good enough”. They quickly got the point! They then started sending me cell phone pics of every job, and yes it was excellent work! Average Spirit equals Average Business and that equals average customer retention. Excellent Spirit equals Excellent Business and that equals EXCELLENT CUSTOMER RETENTION! Always remember to nurture your customer relationships. Make them feel cared about and appreciated. Your customer retention will increase dramatically and your customer loyalty will soar! How do you workload (i.e. allocate the labor) for a janitorial bid when you’re the one doing all of the work? I’ll answer that question in a moment. First, let me just lay a little groundwork. I’m posting this particular blog in response to the many small business owners – those just starting out and doing all the work themselves – that have asked me this very question. To create an accurate, competitive and profitable janitorial bid, you need to accurately calculate what it will cost you to clean this building every month. First, you need to know how many total hours a day are required to clean this building. Then, you need to figure out who will work these hours and at what wage (workloading). The hourly wage that you pay your workers determines your labor cost for the month. Okay, simple enough, when you have actual employees, but back to the original question, how should you workload a bid when you’re the only cleaner? Here’s the straightforward answer that most people seem to resist: Use the same hourly hourly wage that you would pay an employee (if you had one). If you want to grow your janitorial business – and I’m assuming that you do – you’re going to have to hire employees at some point. So from day one you need to think in terms of “What’s my profit margin on this bid” rather than “What’s my desired personal hourly wage”. But when you inflate your wages when pricing a job, you’ve skewed your Profit Margin analysis. In other words, you’ve left no room to gauge your real profit over costs. When you workload using a fair employee wage (albeit a future employee) for your area, you can accurately determine your market costs and derive a bid’s true Profit Margin (which can range from 15% – 40% depending on the type and size of the job)… That’s a fundamental best practice for janitorial business growth! $757 Labor Cost + 30% for payroll taxes, chemicals, misc, etc. = $985.08 YOUR TOTAL MONTHLY COSTS to clean this building. Now add a fair Cost Markup of 33% (which is equivalent to a Profit Margin of 25%) for a Monthly Bid Price of $1,313.44. Your Monthly Profit on this bid is $328.36 a month. And looking ahead to when you have employees, you’ll only spend about 2.5 hrs a week – say 10 hours a month – on this account (i.e. dropping supplies, inspecting, scheduling, talking to customer, etc.). Which you can also think of as making $32/hr for your time actually spent on this job! 4 Total Daily Hours x $20/hr = $80 a day (which covers both your cost + your profit). But no matter how you generate a janitorial cleaning proposal, always think in terms of “What’s my profit margin on this bid?”. The Power of the Donut – Top 12! What’s the power of the donut? What is it about this configuration of sugar and dough (and glaze and cream and jelly and maybe sprinkles) that motivates employees and make them feel appreciated? 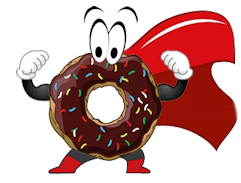 Why is the donut mightier than the cookie, the brownie or the pizza? I’m not exactly sure, but after 25 years of giving my janitorial employees movie tickets, atta boys, bonuses, gift certificates and handshakes, nothing has brought on bigger smiles than a box of donuts at the start of a work shift! Maybe giving a donut for no particular reason says I love and appreciate you and the work that you do. Yep, I think it’s the love, that’s what I’m going with! Let me be a little more specific. It’s the box of assorted dozen donuts that does the trick. There’s something for everyone. Don’t like chocolate, go for the glazed. Don’t like sprinkles, go for the bear claw. Everyone’s happy! Let me give you a dozen assorted ways to make your employees love you! PLAIN GLAZED DONUT: The original yummy. If an employee doesn’t like this one, you might think about replacing them. CHOCOLATE GLAZED: My personal favorite. Unless they hate chocolate, they will feel the love. BEAR CLAW: Not really a donut, but someone will like it. If this is their first choice, keep an eye on them. CHOCOLATE ECLAIR: Again, not really a donut, but they will draw straws for this one. Probably wise to get a couple of these. VANILLA GLAZED: For the few that don’t like chocolate. Again, keep an eye on the chocolate haters. GLAZED JELLY FILLED: Blueberry or Raspberry is best. If no one likes it, I’ll eat it and be happy. SPRINKLES ON TOP: I don’t really like or get this one, but I respect and accept the employee that does. APPLE FRITTER CRULLER: Usually there’s one odd employee that loves this one. I accept this oddball. CARAMEL COFFEE CREAM: Not my top choice, but any coffee lover will like this one. CHOCOLATE ICED WITH CUSTARD FILLING: Well duh..this should be a “Do you like this donut” question on your employment application, and a “No” answer should disqualify this applicant! CHOCOLATE ICED WITH CREAM FILLING: This is a good donut if you didn’t get a custard filled one. POWDERED CAKE: My least favorite, but someone will love it. Get rid of this person anyway.